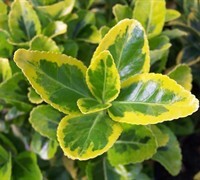 Golden Euonymus is an evergreen shrub which features outstanding, colorful yellow and green variegated foliage year round! 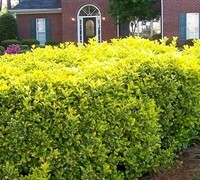 Golden Euonymus is a fast grower that is useful as a colorful hedge or as a brilliant accent plant in foundation plantings or landscape beds and islands. 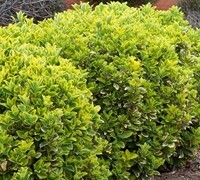 It is very easy to grow in a wide variety of conditions and soil types. Prefers full sun with average moisture, but tolerates drought and some partial shade. 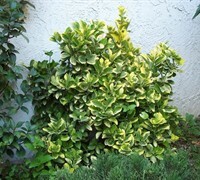 It can be maintained at virtually any height, shape, or size with pruning or trimming.